We recently worked on this beautiful kitchen in collaboration with Newcastle Design. The mixture between the stunning Natural Stone and Silestone Quartz on the worktops works effortlessly. The daring Foussana Grey Limetsone floor tiles work seamlessly with the natural Statuario Quartzite on the backsplash. Quartzite, in it’s purest form, is white like marble, but can have impurities in it that lead to some incredible patterns and colors. 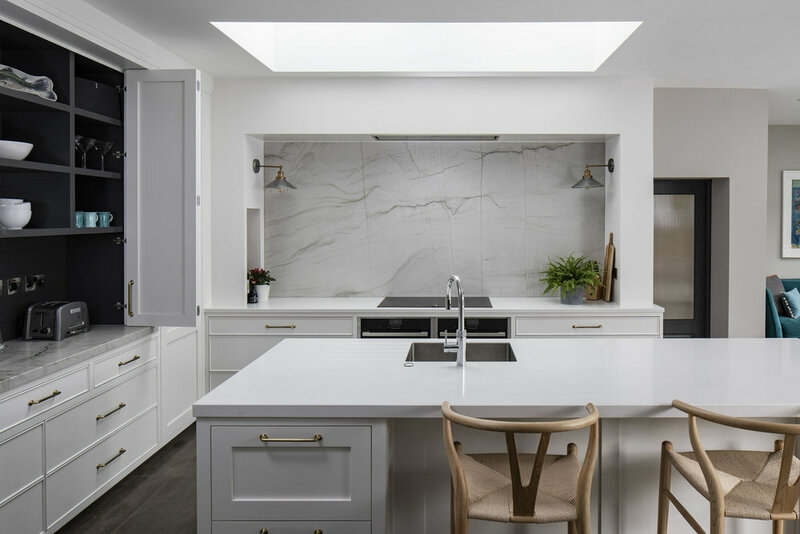 Such is the case with the Statuario Quartzite used in this kitchen, with its incredible beauty and strength. Quartzite’s durability and low maintenance have elevated the natural stone to sweetheart status amongst homeowners. The major advantage of getting a quartzite countertop is the absence of calcite, meaning these slabs will not etch like marble. Holders of kitchen countertops designed with quartzite will not have to fret every time juice, wine or lemon come in contact with their precious natural stone. Materials Used: Statuario Quartzite and Eternal Statuario Silestone on kitchen worktops. Foussana Grey Limestone tiles on floor. All by Miller Brothers Stone.